While this doesn't paint a pretty picture for the run game, either, after halftime Michigan passed on 60% of its first downs, got one completion on a short route that turned into a big gain when Roundtree broke a tackle, and did nothing else. For the game Michigan tried to pass at least 41 times*, averaging 2.8 yards per attempt and giving up a defensive touchdown. Michigan tried to run the ball 26 times and averaged… oh, Jesus… 5.2 yards per carry. Fitzgerald Toussaint got two carries, Denard twelve. These numbers seemed wrong and after looking through the box scores that I typically look at (Rivals and ESPN), I still don't know where these numbers came from. Both box scores say that Michigan ran the ball 36 times for 82 yards (an average of 2.3 yards per carry). In college, sack yardage is inexplicably taken away from the running game, but even if we add in the yards from Michigan's seven sacks (62), Michigan average only 4 YPC (144 yards with sacks removed), not the gaudy 5.2 YPC that Brian cites. That's two base-offense carries, one scramble, and two jet sweeps. If you excise those rushes and sacks, Michigan produced 64 yards on 29 carries (2.2 YPC). This isn't a particularly fair process--you can't just cherry pick Michigan's best runs and remove them--but the sustainability of running Incredibly Surprising Denard Jet Sweep is questionable and scrambles can't be relied upon to produce consistent rushing numbers. Not that any of this really matters, but it does at least confirm what I saw on Saturday: Michigan couldn't run in this game because Michigan State was loading the box and forcing Denard to throw the ball. [UPDATE: A commenter notes that if we remove sack yards from rushing totals, we also have to remove the rushing attempts. Therefore, Michigan produced 144 yards on 29 carries (4.9 YPC). For the cherry picked rushed above, Michigan average 64 yards on 24 carries (2.6 YPC). Similar logic applied to the passing numbers. If you add rushing totals back into the passing numbers, Michigan netted 102 yards on 38 attempts (2.7 YPA). 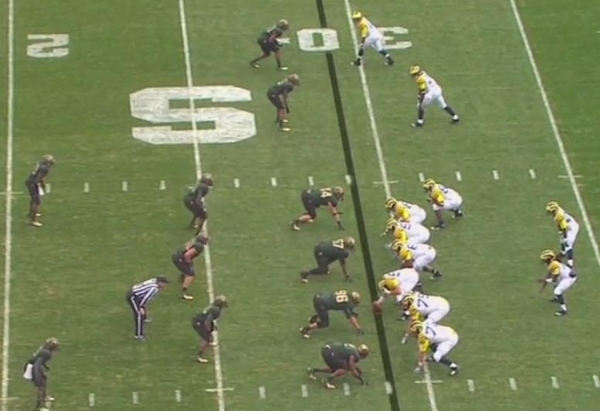 Regardless of the weather, you don't run against this formation. You can't. MSU's safeties are 8 yards beyond the line of scrimmage and the defense is essentially playing cover zero. If your receivers can't get open (and QB can't throw to them) with this coverage, you're not winning. Before the game, the logic was that the wind would hurt Michigan State more because they relied more heavily on the passing game. In reality, Kirk Cousins, being a much better passer than Denard, was able to more effectively manage the adverse conditions. The Spartan defense, therefore, was able to key on the running game because of Denard's existing passing struggles in addition to the blustery conditions. That's Michigan's best receiver (Junior Hemingway) lined up in the slot with a safety 10 yards off the line of scrimmage in man coverage. Michigan would run a pitch option here that would net two (TWO!) yards. On the next play, Drew Dileo will dive for the first down on Michigan's fake punt. For a coordinator that tries to exploit man coverage by taking shots down the field, it's willful stupidity not to throw bubble screens when a defense aligns like this. 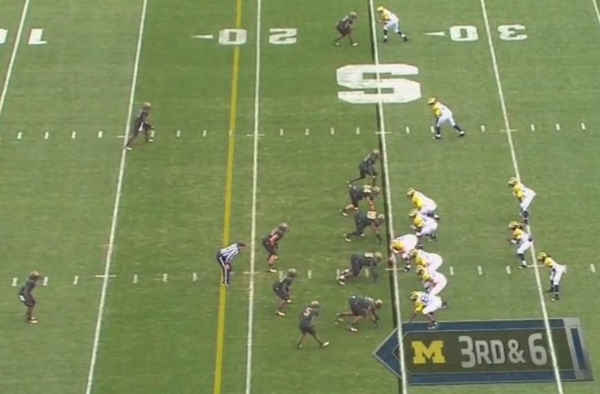 Worse still, Michigan ran into a defensive front that had eight men in the box openly showing a run blitz. Even one of those throwback screens that Michigan has used this season would have worked; MSU was overpursuing for most of the game. I don't think Michigan threw the ball too much against MSU. The bigger problem was the passing routes that the team ran. With a defense so obviously selling out on the run by constantly blitzing (which also stopped deep routes), the short hitches and screen passes that Denard has proven he can throw would've been a superior option to the deep routes that Borges called in an attempt to exploit single coverage on the outside. Of course, that's where I got crossed up. Even removing sack attempts, that still only gets Michigan to 4.9 YPC, certainly closer to the 5.2 cited by Brian but still not there. The point remains, I think Michigan struggled running the ball in this game as I'll show later in the week. Thanks for the correction though. I think what Brian was looking at was the "loss" yardage in the mgoblue boxscore (http://www.mgoblue.com/sports/m-footbl/stats/101511aaa.html), which separately breaks out runs that went for positive yardage and runs that went for negative yardage. I think he took the 151 yards gained to be the number that excluding sacks, giving him 29 carries for 151 yards, or 5.2 ypc. The error here is that Vincent Smith had a run that lost 5 yards, which brings you to 146 yards on 29 carries, or 5.0 ypc. Good catch. I don't usually check the MGoBlue box score. I suppose I will from now on. That must be where he got his numbers.